2016 Stereo Room may only offer one algorithm, but it's a real beauty. Great for drums; smooth reverb tail; good, usable presets; useful Position control. Only one algorithm; mix setting inconsistent on presets; decay times limited for long settings. 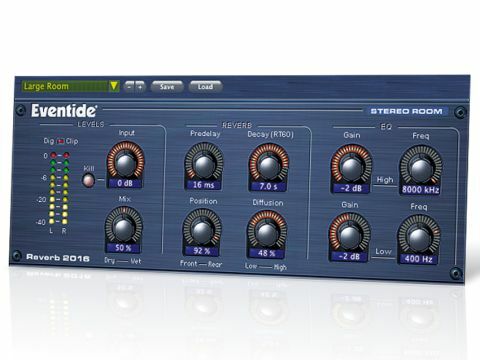 Eventide's recently launched Omnipressor plug-in is a full-on native recreation (VST/AU/AAX) of its hardware classic. However, it would seem the company has taken a more focused, less completist route with the 2016 Stereo Reverb plug-in, also a native release. It includes just one algorithm - Stereo Room - from the many reverbs, delays and effects found in Eventide's '80s SP2016 hardware unit. "Boosting the Low EQ can turbocharge the decay and, as long as you keep the levels in check, the tail is wonderfully smooth." But rather than recreate the SP's impenetrable interface (typical of the era), it has opted to match its more recent Reverb 2016 box, pretty much knob for knob. The controls are split into three main areas: Levels, Reverb and EQ. The Input control (an attenuator), Mix control and LED input meters are all standard fare, but welcome extras include a latching input 'kill' switch and a digital clipping (Dig Clip) LED that indicates clipping in the reverb matrix itself. The Reverb section includes your standard Predelay, Decay and Diffusion controls, plus the Position dial. This last affects, amongst other things, the early and late reflection balance, andenables positioning of the source signal between the 'front' and 'rear' of the emulated room space. The 2-band EQ section is very useful for reverb tailoring. The two EQ bands are adjustable from 50-500Hz and 1-8kHz, with the High band offering only attenuation (up to -8dB) and the Low band offering boost and attenuation (up to+4dB and -8dB). Stereo Room includes 14 standard presets, plus 23 extras by Dave Pensado, George Massenburg, Joe Chiccarelli and Oliver Momm. Of the 37 factory patches, although some are generic (Large Room, Nice Stereo Room), the vast majority are drum-, vocal-, guitar- or string-focused, of which we wholly approve. We started our testing with the snare drum options. All offered a very smooth, diffuse sound, with restrained top-end twang, so we weren't tempted to reach for the High EQ. It's a similar story with the kick drum presets, and to make things interesting there are a few 'long boom' style patches in there, as well as an orchestral bass drum setting with big predelay. Moving on to the string, vocal and piano presets, the open and natural sound of the 2016 is very striking once again. There's certainly nothing invasive here, and whether you're looking for a short, tight ambience or something bigger, you can't really go wrong. It quickly becomes apparent that the Position control has a huge influence on the sound. If you're used to the decay control being your main reverb tail-shaping tool, you'll love the way the 2016 encourages you to blend scale and proximity to create space that doesn't swallow up the sound. With decay time of up to 30 seconds, massive FX-style sustained 'verbs are easily achieved, although the selectable increments (10, 15 and 30 seconds) are a little inflexible. Boosting the Low EQ can also turbocharge the decay and, as long as you keep the levels in check, the tail is wonderfully smooth. Our only minor bugbear is that some patches launch at 100% wet and others don't, for no clear reason. Stereo Room does a superb job of capturing the feel and sound of 80s-style algorithmic reverb. The only real limitation is the fact that only one algorithm is included.